To find out your card code, look for the last three numbers on the back of your credit card. 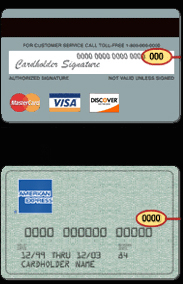 AMEX users find your four digit security code on the front side of the card above the last group of numbers on the right. Sign up today and let the pro's at FleetRates.com assist you in finding the best deal when buying or leasing your new car. Dealers Sign Up Now & Get More Calls, Fresh Daily Leads & Sell More Cars Online with This Limited-Time Special Low Offer. No Set Up Fee's, No Long Term Contracts, Renew or Cancel Anytime! Are You One Of The 2750+ New & Pre-Owned Dealers Posting Over A Half Million+ Cars For Sale Online With FleetRates.com? If Not, Take Advantage Of Our Specially-Priced Premium Dealer Programs Today! Sign Up Now And A Representative Will Call You With-in 48 Hours Confirming Your Order. Post UNLIMITED amounts of Both new and pre-owned inventory live on FleetRates.com with our fully automated vin decoded software program. Gold Supplier Ranking receiving priority call status when sourcing vehices for FleetRates.com Club Members. You get SEO Optimized inventory listings with unique custom meta tags, titles, descriptions and even urls with your dealer name and phone number on every item giving you guaranteed keyword search results and phone calls. See your inventory dominate the net on Google, Yahoo, Bing, MSN and more. Sign up and making payments is easy with our simple automated program. Dealers: For a limited time join the already over 2750+ auto dealers posting Over a Half Million+ cars for sale on FleetRates.com with this special offer. Sign up now and post your entire UNLIMITED amounts of New And Used inventory for sale on FleetRates.com for only $199.95/month! No long term contracts, renew Or cancel anytime. Sign up online now with our simple fully automated software program and gain full-market penetration by exposing your inventory Nationwide on FleetRates.com, the leader in online automotive marketing since 2003, for an unheard of low price of $199.95/mo! Take advantage of the most cost effective dealer marketing program on the net today.This signs you up for our fleetrates.com newsletter.